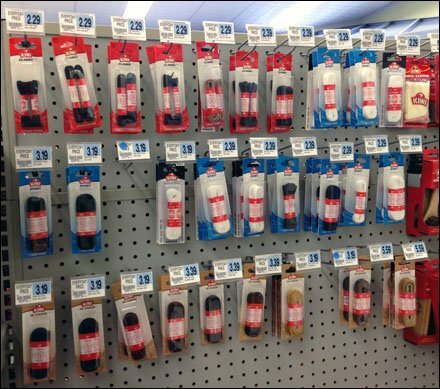 Normally the content here on FixturesCloseUp focuses on how to tighten displays and increase merchandising density to ultimately lift sales. But there might be times when you want wider item spacing and a looser display. Then individual packages speak out more, and the display looks less like wallpaper due to edge-to-edge packages. 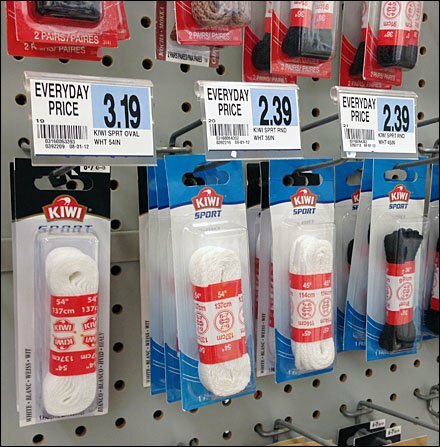 These shoe laces look … and probably sell … better with an extra row of Pegboard Holes between. CLICK the thumbnail for a closer look. Hookery is All Wire Flip-Front Scan Hooks.